A variety of subjects are raised in the articles published in the Fall 2016 issue of Forum Philosophicum. Emmanuel Nartey (“Omniscience, Free Will, and Religious Belief”) offers a critical overview of the arguments put forward in current debates over whether, if one accepts the existence of a God who has infallible foreknowledge of our actions, it is possible for humans to be free. Carl Humphries addresses the relationship between ontological and historical modes of intelligibility in the context an analysis of the implications of Herman Schmalenbach’s historico-philosophical treatment of the concept of Einsamkeit (“lone-ness”) as this relates to the spiritual practices and religious beliefs of Christianity (“Schmalenbach on Standing Alone before God: A Philosophical Case-Study in Ontologico-Historical Understanding”). 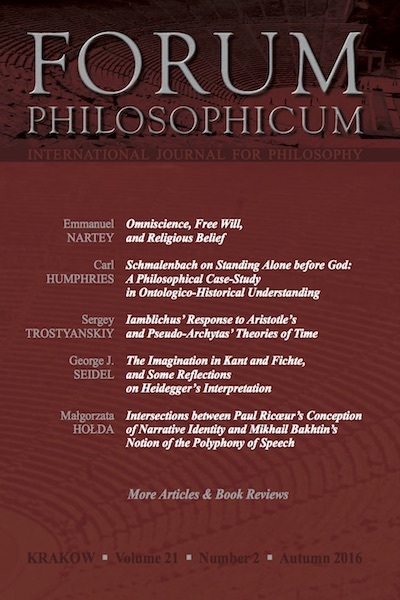 Sergey Trostyanskiy proposes an account of Iamblichus’ solutions to the paradoxes of time through a comparative approach invoking earlier discussions of problems of temporality in Aristotle and Pseudo-Archytas (“Iamblichus’ Response to Aristotle’s and Pseudo-Archytas’ Theories of Time”). George J. Seidel compares the treatment of the imagination in Kant and Fichte, relating both stances to discussions of the imagination in Heidegger (“The Imagination in Kant and Fichte, and some Reflections on Heidegger’s Interpretation”). Małgorzata Hołda brings to light the parallels and intersections between philosophical approaches to narrative in Paul Ricœur and Mikhail Bakhtin (“Intersections between Paul Ricœur’s Conception of Narrative Identity and Mikhail Bakhtin’s Notion of the Polyphony of Speech”).